More than three decades since it debuted at the Liverpool Playhouse, Winsome Pinnock’s theatrical masterpiece Leave Taking is back in London. One is of the most poignant and relevant plays of the Post-war era. Pinnock is the godmother of Black British theatre and a child of the Windrush. London, Deptford: in her rickety flat Mai (Adjoa Andoh, Bush Theatre debut) is sipping a beer, dutifully determined to enjoy a well-earned day of rest. But Enid and her daughters, the quietly smart and overachieving Viv (Nicholle Cherrie), and Del (Seraphina Beh), the ‘troubled one’, independent and rebellious, knock at her door, Mai doesn’t need her clairvoyant skills to figure out that they have a lot of work to do. The devil is not only in the details, but it feeds on the stubborn silence and well-kept secrets of single mother, Enid, a Jamaican expatriate who quickly learned that the streets of “Inglan” are not paved with gold. Streets where she is invisible, negligible and alien, too far from home and never at home. The devil lies in the insurmountable distance that her silence dug between the girl she was and the woman she became, between her Jamaican roots and her damp present, between her compliant attitude towards Britain and her daughters’ discomfort. “How are you gonna teach your children they don’t exist?” Enid asks in a moment of painful but necessary awakening. Resilient drops of water start flooding her house and the walls she built around her soul to keep nostalgia at bay start falling apart, with that memories unravel, unspeakable truths find their way to the surface and the true healing begins. Leave Taking is a story about migration, but not only; it is certainly a story about generational and cultural gap, but not entirely. It’s a story about womanhood, identity and belonging, a cautionary tale about the dreadful and disappointing encounter with a cold and merciless country, broken dreams and secrets, and the many coping mechanisms people hang on to survive. But first and foremost, this is an intimate conversation between women, a tender dance, a journey towards self-discovery and a struggle to find a language, a voice, to become visible. It’s a story about people and chickens, backyards and landladies, sound systems and Shakespeare, about characters who are both archetypal and extraordinarily humans, incessantly torn between two countries, identities, feelings and emotions and perspectives. Where the hard-working Enid stashed her longing for home in a tidy recess of her mind while her dear friend Broderick (Wil Johnson) holds on to his roots like they could keep him alive – and maybe they can –Viv and Del painfully explore the meanings of home, the untold past and the conflicting reality of being Jamaican but not quite, and just not British enough. Leave Taking is timeless and relentlessly contemporary, directed by Madani Younis (The Royale), with a stellar cast and an atmospheric mise-en-scene, it is an engrossing, powerful, melancholic and intense tale about healing, womanhood, roots, identity, and the harsh discovery of what does it mean to be Black and British. Details: At the Bush Theatre it runs until 30th June 2018. Cast includes: Wil Johnson and Sarah Niles. 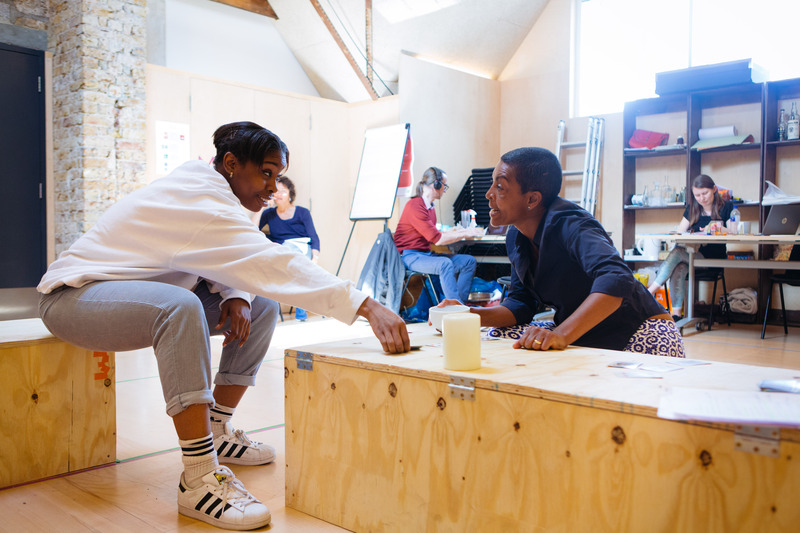 Main image: Seraphina Beh and Adjoa Andoh in rehearsals for Leave Taking at the Bush Theatre © Helen Murray. Address: Bush Theatre 7 Uxbridge Road Shepherd’s Bush London W12 8LJ. Book tickets.